There is only limited information on the functional status (FS) of patients receiving hemodialysis (HD) from developing countries where the etiology of chronic kidney disease (CKD) and demographic profile are different. The study aims to assess the FS in patients with CKD using three validated generic instruments. A total of 116 adult patients on HD with a dialysis vintage >3 months were enrolled. FS was assessed using three generic tools – Functional Independence Measure (FIM) (scores 18–126), Seven domains and five levels (7D5L) (scores 0–28), and Activities of Daily Living Questionnaire (ADLQ) (scores 0–6) scales. A higher FIM and ADLQ scores and lower 7D5L score indicated good FS. The mean age of patients was 41.28 ± 15.44 years. About 77.6% were males and 80.2% were unemployed. About 67.2% were receiving twice-weekly HD, and 28.4% were receiving thrice-weekly dialysis. The mean scores were 119.05 ± 11.42 with FIM, 6.44 ± 4.26 with 7D5L, and 5.51 ± 1.19 with ADL instruments. More than 80% showed full functional independence with ADLQ instrument. With FIM, the overall scores showed a tendency for functional independence, but the subdomains involving locomotion/mobility were impaired to a greater extent. The proportion of patients with full independence was less with 7D5L. We observed an inferior FS in individuals <40 years. Patients on HD were functionally independent as assessed by FIM and ADLQ instruments. However, 7D5L appeared to be better in identifying mild to moderate limitations in daily activities. The domains involving motor tasks seem to be affected to a greater extent. The current scales for assessing FS do not incorporate a time-dependent component. Chronic kidney disease (CKD) is a major public health hazard, imposing a significant burden on healthcare systems. With increasing life expectancy and a higher burden of lifestyle-related disorders, the prevalence of CKD is showing a rising trend. Functional status (FS) of an individual reflects his or her ability to do normal activities required to meet daily basic needs, fulfill usual roles, and to maintain health and well-being. A good FS is a key contributor to quality of life. Advancing age and presence of chronic medical conditions are established factors affecting the functional capacity of any individual. A low FS is often associated with inferior survival in elderly persons and patients suffering from chronic diseases. As in other chronic medical conditions, FS correlates with patient morbidity and mortality in elderly patients with CKD.,,,, Dialysis therapies, especially hemodialysis (HD), may introduce restrictions on day-to-day activities and might lead to treatment-related complications and cognitive disturbances, which might further worsen the FS of the affected individual. A few studies using generic instruments have documented poor FS in elderly patients with CKD on HD., Data from the DOPPS study showed that FS independently contributes to mortality in patients undergoing dialysis, even after adjustments for age and other covariates. There is only limited literature on FS in patients undergoing dialysis from the developing countries. There are limitations in extrapolating the existing data to the developing world, as there are significant differences in the etiologic profile and demographic characteristics. Patients undergoing dialysis in the high-income countries tend to be older, with significant comorbidities such as hypertension, diabetes, and coronary diseases. Whereas, patients receiving dialysis in the developing countries tend to be younger, often under 50 years of age with fewer comorbid conditions. The extent of functional impairment caused by end-stage renal disease (ESRD) and dialysis in comparatively younger populations without significant comorbidities is relatively unknown. There is no kidney-disease-specific instrument for assessing FS. A variety of generic tools for assessing FS in general population are validated in elderly patients with kidney disease, but whether they can accurately estimate the extent of FS in younger individuals is not clear. To the best of our knowledge, there is no published literature on FS in Indian patients on HD. There are no published data on the sensitivity of the various available generic tools to pick up milder degrees of functional compromise in relatively younger population with ESRD. We wanted to test which is the best tool to assess the FS in Indian patients on maintenance hemodialysis (MHD), who are relatively younger compared to the western counter parts. In this study, we used three validated generic instruments – Functional Independence Measure (FIM) instrument, Seven domains and five levels (7D5L), and Activities of Daily Living Questionnaire (ADLQ). All patients with ESRD on maintenance HD (MHD) with dialysis vintage more than 3 months attending nephrology outpatient dialysis clinics from March 2017 to July 2017 were enrolled. Patients with severe liver disease, cardiac failure, stroke or other mobility disorders, HIV with AIDS, malignancy, tuberculosis or any other chronic illness, and significant cognitive disturbance were excluded. The minimum sample size calculated was 114, assuming that 60% of patients on MHD had poor FS, at 5% significance and 15% relative precision. The study protocol was approved by Institute Ethics Committee. The demographic and clinical details were collected at the time of enrollment. The FS was assessed using three generic instruments – ADLQ or Katz Index, FIM, and 7D5L. ADLQ assess the level of impairments in the activities of the daily living under six bodily functions: bathing, dressing, toileting, transferring, continence, and feeding. One point is given if no supervision, direction, or assistance is needed to perform an activity. In case if supervision, direction, personal assistance, or total care is required, then a score of 0 is assigned. A cumulative score of 6 indicates full function, 4 indicates moderate impairment, and 2 or less indicates severe functional impairment. FIM assesses functional independence under 18 items, with points varying from 1 to 7. These 18 items are grouped under six subdomains such as self-care, sphincter control, transfers, locomotion, communication, and social cognition which are further grouped into two domains – motor and cognition. Each subdomain has scores from 1 to 7, with a score of 7 given for full independence. The maximum total score from FIM is 126, and the minimum score is 18, with higher scores representing good FS. 7D5L is an extended version of Euro QoL (5D3L) (Euroqol Group, EuroQol 1990) and 6D5L (Mahapatra et al. 2001). Functional independence is assessed under seven domains which include mobility, self-care, usual activity and pain/discomfort (physical), anxiety/depression, cognition (mental), and social participation (social). The degree of severity across each domain was assessed on five levels ranging from no difficulty (0 points) to profound difficulty (4 points). Individual scores of all the seven areas were added up to get the overall severity score which ranges from a possible minimum score of 0 (full independence) and a maximum of 28 (complete dependence). Unlike FIM and ADLQ, a lower score indicates better FS in 7D5L. These scales except 7D5L have been used previously in patients with CKD and HD. All the assessments and scoring were done by the first author, after undergoing training for administering the tools. All categorical data were expressed as frequencies and percentages, and continuous data were expressed as mean with standard deviation or median with range. The comparison of FIM, 7D5L, and ADLQ scores between the categorical variables was carried out using independent Students' t test. All statistical analyses were carried out by at 5% level of significance, and a P value <0.05 was considered as significant. The data were analyzed using SPSS software version 19 (IBM; Armonk, NY, USA). A total of 116 patients were recruited for the study. Sixty-four patients (55.2%) were undergoing dialysis from the parent institution and the remaining were receiving dialysis from stand-alone dialysis units/peripheral centers. 59 (50.9%) patients were from rural areas. 85 patients (69.8%) were employed before dialysis initiation, but the majority were unemployed at the time of recruitment. 67 (57.7%) received twice-weekly erythropoiesis-stimulating agents (ESA) and iron supplements on a regular basis. The demographic and clinical characteristics are shown in [Table 1]. CKD of unidentified etiology (CKDu) was the most common cause of ESRD. The ADLQ and FIM instruments showed values close to the maximum score indicating full functional independence. 7D5L instrument showed a mild limitation of daily activities [Table 2]. With ADLQ, more than 85% of the population could perform all tasks independently [Table 3]a. With FIM too, more than 80% of patients had full independence in most of the tasks. But certain specific tasks such as climbing stairs and specific domains such as comprehension and memory were compromised in a higher proportion [Table 3]b. With 7D5L, the percentage of patients who had full independence in all domains was comparatively less. 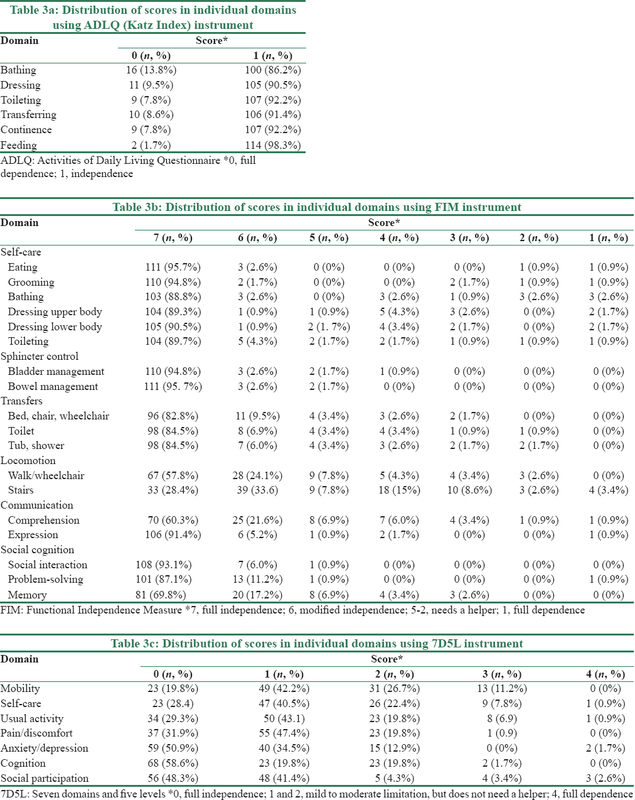 About half of the patients had complete independence in domains such as anxiety/depression, cognition, and social participation, whereas the proportion of patients with full independence for mobility, self-care, and usual activity was lesser [Table 3]c. However, the percentage of patients who had a severe disability requiring external assistance was minimal. We tried to analyze the impact of selected categorical variables on FS. Age less than 40 years and low serum albumin were associated with an inferior FS as assessed by 7D5L [Table 4]. Among individuals age <40 years, the prevalence of CKDu was higher [(80%; n = 46/57) vs 54.5% (n = 31/59); P < 0.001). Other parameters such as parathyroid hormone (PTH), and hemoglobin were not significantly different in individuals with age <40 years. This study used three generic instruments to measure the activities of daily living – FIM, ADLQ (Katz Index), and 7D5L – in patients with kidney disease on MHD. The majority of the patients were found to be fully independent by FIM and ADLQ, whereas variable degrees of modified independence (completing activities with difficulty, but not needing a helper) was documented using 7D5L. FS is a key contributor to quality of life but often overlooked in patients with CKD, especially in younger patients on HD. Multiple factors such as bone mineral disorders, cardiac disease, cognitive/sleep disturbances, and endocrine dysfunction associated with kidney diseases can limit the functional capacity of the individual. In addition, patients require significant changes in lifestyle, eating habits, and often face restrictions on day-to-day activities as part of disease management. In general population, functional dependence is usually retained till 60s or early 70s. Since kidney disease imposes significant restrictions on physical and mental health, day-to-day activities can be compromised to a great extent. Elderly patients receiving HD in outpatient, as well as inpatient settings, generally tend to have a poor FS.,,,, Dialysis initiation itself may lead to a steady and sustained reduction in FS in elderly adults with CKD. Sedentary patients undergoing dialysis are reported to have higher mortality rates compared with active counterparts. In addition to morbidity and mortality, a good FS is predictive of compliance with dialysis as well. The DOPPS study showed that with increasing age, the FS in patients undergoing dialysis tend to show a progressive decline with increasing age. Even though there are a good amount of data on suboptimal FS in elderly patients undergoing dialysis, the same cannot be extrapolated to comparatively younger patients on HD. Age itself is a major deciding factor of the FS of an individual. The disabilities associated with CKD or dialysis might have a multiplying effect in older people resulting in overall poor FS. On the other hand, FS in younger individuals might be a reflection of the limitations imposed by disease per se. There are only minimal data on the impact of CKD on FS in younger persons. The DOPPS study identified dialysis as an independent contributory factor for poor FS, even after adjusting for covariates such as age and other co morbidities. Even though the DOPPS study included all patients older than 18 years, the mean age of patients was around 60 years, implying that the observation cannot be generalized to younger dialysis cohorts. The proportion of patients older than 60 years in this study was only around 12%. We observed some differences in the ability of the three instruments to identify the level of independence in activities of daily living. With ADLQ (Katz Index) and FIM, a higher proportion of patients showed full functional independence. Using ADLQ (Katz Index), almost 90% of the population showed complete functional dependence in all domains. In FIM instrument, individual domains such as locomotion, memory and comprehension were compromised to a greater extent. Specific tasks such as walking stairs tend to be affected to a great extent. However, the impairment was often mild, and the patient was able to finish the work without the help of a second person. With 7D5L, almost half of participants scored full independence in fields such as anxiety, cognition, and social interaction. Whereas, in domains involving motor activities, only around one-fifth of the participants were entirely independent. Again, the limitation was mild and did not necessitate the presence of a helper. There is no validated kidney-disease-specific tool for assessing FS in patients on HD. The three instruments used in the study differ slightly in the way they determine independence and dependence. ADLQ (Katz Index) categorizes FS into two categories. If a patient does not require supervision, direction, or personal assistance, the person is considered to be fully independent and given a score of 1. Whereas, in FIM, independence is divided into full independence and modified independence (finishing the task with the help of a device – like using a cane for walking, using the support of side rails while climbing stairs, etc.). An entirely independent patient gets a score of 7. On the other hand, irrespective of the severity, a score of 6 is awarded to patients who encounter difficulties in activities of daily living but does not need a helper. In 7D5L, of total five levels, three levels (levels 1–3; scores 0–2), represent patients who do not require external help. Level 1 represents complete independence (score 0), whereas level 2 and 3 represent mild to moderate difficulty in performing activities of daily living. Unlike elderly and patients suffering from mobility disorders, younger patients with CKD often do not require external assistance in their activities of daily living. Most of the patients admitted to finishing the task alone, without devices or external support, but the overall time taken was longer. Such patients would be classified as having full independence by ADLQ and FIM, whereas they will be classified as having a mild or moderate limitation of independence by 7D5L. This explains why a lesser proportion of patients qualified as having full independence by 7D5L. Moreover, all instruments for assessing FS carry a certain amount of subjectivity, which is comparatively less with 7D5L, where each level of dependence is predefined. 7D5L was developed and tested in comparatively younger populations with filarial lymphedema where predominantly motor activities and social participation are compromised to a greater magnitude. ADLQ and FIM might be better in patient populations requiring assistance by a second person, whereas 7D5L might be better suited for assessing FS in patients who do not need help. A similar observation was made by Jassal et al. They reported that the majority of patients showed full independence when activities of daily living were assessed using ADLQ, whereas addition of a questionnaire for instrumental activities showed significant limitations in FS. None of the three scales used in this study included a time-dependent component for assessing daily activities. Incorporating an objective time-dependent component for activities of daily living might further enhance the sensitivity of the tool. Recognizing mild impairment in activities of daily living is important from the patient perspective. About 70% of the participants were previously employed, but only around one-fifth were able to get employment once they started dialysis. The majority of the participants were from rural areas, predominantly depending on farming and construction-related activities for livelihood. One factor contributing to the loss of employment is frequent absenteeism due to hospital/dialysis unit visits. Another major reason for job loss might be mild limitation in physical activities, which interfere with work, especially among people who perform unskilled physical labor. Employment is an integral part of self-esteem; the lack of same is found to be a contributory factor for depression in patients on dialysis. Maintaining proper mental health is essential for the physical and social well-being of the individual. Mental and physical health are often inter-related. Knight et al. reported that there was a graded increase in mortality in patients undergoing dialysis with worsening mental health. Younger age, male gender, and higher albumin and hemoglobin levels are associated with better FS., Interestingly, we found that age less than 40 years is associated with an inferior FS by 7D5L. The other tools also showed a similar trend but did not attain statistical significance. One probable reason for the poor FS in individuals less than 40 years might be suboptimal dialysis and low hemoglobin levels. The majority were on twice-weekly HD. We do not have data on dialysis adequacy. Other potential contributory factors such as malnutrition also might be relevant. A higher proportion of patients less than 40 years had CKD of unidentified etiology. CKDu, by virtue of tubulointerstitial involvement, may lead to more acidosis and bone disease, which might have a deleterious effect on FS. Poor FS in younger individuals needs to be explored further with more longitudinal studies involving comprehensive assessment of etiology of kidney disease, nutritional status, and dialysis adequacy. We did not find any differences in FS according to gender. More than 75% of participants were male, probably reflecting a gender bias in seeking treatment for chronic illness. Anemia did not turn out to be a predictor of good FS in this study. However, the mean hemoglobin level in the study population was considerably lower than the current standards. The proportion of patients who had hemoglobin levels above 11.5 g/dL was lesser. Only 15 patients had hemoglobin values exceeding 10 g/dL. The majority of the patients were receiving twice-weekly dialysis, due to resource limitations. Even though we did not find any difference between twice- versus thrice-weekly dialysis, for a meaningful interpretation, data on dialysis adequacy are needed. We believe that anemia and suboptimal dialysis would be the major contributory factors for suboptimal FS. There was no regular dynamic exercise program in the dialysis unit, which also might contribute to musculoskeletal complaints. As the majority were having a per capita income lesser than the minimum national standards, we did not attempt to assess the relationship between socioeconomic status and FS. The study has a few limitations. The primary intention of the study was to identify the best tool to assess the FS in a relatively younger ESRD population on MHD. Elderly individuals and patients with severe comorbidities, which might independently contribute to poor FS were excluded. Hence, recruitment was limited to the relatively healthy MHD population. As the study population included only individuals who were deemed fit, the results might not be reflective of the FS of general dialysis population with multiple comorbidities. The study is underpowered to assess the clinical and biochemical determinants of FS. More longitudinal studies are required to assess the determinants of FS. We do not have data on dialysis adequacy and bicarbonate levels. Around 45% of patients were receiving dialysis from stand-alone dialysis units, not affiliated to our hospital. Hence, we could not collect pre-dialysis bicarbonate levels in these patients. All other biochemical investigations were done on immediate post-dialysis day. This might account for the relatively higher albumin levels as well. We do not have data on the nutritional status and dietary patterns, which would play a major role in determining the FS. The existing generic tools have limitations in assessing the FS in relatively younger patients on HD. Of the three generic instruments used, 7D5L identified milder limitations in activities of daily living to a greater extent. Among younger patients undergoing dialysis, 7D5L might be superior in assessing modest limitations of independence, not amounting to assistance by helper. The most common complaint was the delays in performing activities of daily living, especially motor tasks, which are not addressed sufficiently by the current instruments. Kurella M, Ireland C, Hlatky MA, Shlipak MG, Yaffe K, Hulley SB, et al. Physical and sexual function in women with chronic kidney disease. Am J Kidney Dis 2004;43:868-76. Shlipak MG, Stehman-Breen C, Fried LF, Song X, Siscovick D, Fried LP, et al. The presence of frailty in elderly persons with chronic renal insufficiency. Am J Kidney Dis 2004;43:861-7. Fried LF, Lee JS, Shlipak M, Chertow GM, Green C, Ding J, et al. Chronic Kidney Disease and Functional Limitation in Older People: Health, Aging and Body Composition Study. J Am Geriatr Soc 2006;54:750-6. Odden MC, Shlipak MG, Tager IB. Serum creatinine and functional limitation in elderly persons. J Gerontol A Biol Sci Med Sci 2009;64:370-6. Bowling CB, Sawyer P, Campbell RC, Ahmed A, Allman RM. Impact of chronic kidney disease on activities of daily living in community-dwelling older adults. J Gerontol A Biol Sci Med Sci 2011;66:689-94. Cook WL, Jassal SV. Functional dependencies among the elderly on hemodialysis. Kidney Int 2008;73:1289-95. Jassal SV, Karaboyas A, Comment LA, Bieber BA, Morgenstern H, Sen A, et al. Functional Dependence and Mortality in the International Dialysis Outcomes and Practice Patterns Study (DOPPS). Am J Kidney Dis 2016;67:283-92. Sonn U. Longitudinal studies of dependence in daily life activities among elderly persons. Scand J Rehabil Med Suppl 1996;34:1-35. Jassal SV, Chiu E, Hladunewich M. Loss of independence in patients starting dialysis at 80 years of age or older. New Engl J Med 2009;361:1612-3. Shelkey M, Wallace M. Katz Index of Independence in Activities of Daily Living (ADL). Director 2000 Spring;8(2):72-3. Keith RA, Granger CV, Hamilton BB, Sherwin FS. The Functional Independence Measure: A new tool for rehabilitation. Adv Clin Rehabil 1987;1:6-18. Krishna Kumari A, Harichandrakumar KT, Das LK, Krishnamoorthy K. Physical and psychosocial burden due to lymphatic filariasis as perceived by patients and medical experts. Trop Med Int Health 2005;10:567-73. Kurella Tamura M, Covinsky KE, Chertow GM, Yaffe K, Landefeld CS, McCulloch CE. Functional status of elderly adults before and after initiation of dialysis. N Engl J Med 2009;361:1539-47. Lo D, Chiu E, Jassal SV. A prospective pilot study to measure changes in functional status associated with hospitalization in elderly dialysis-dependent patients. Am J Kidney Dis 2008;52:956-61. O'Hare AM, Tawney K, Bacchetti P, Johansen KL. Decreased survival among sedentary patients undergoing dialysis: Results from the dialysis morbidity and mortality study wave 2. Am J Kidney Dis 2003;41:447-54. DeOreo PB. Hemodialysis patient-assessed functional health status predicts continued survival, hospitalization, and dialysis-attendance compliance. Am J Kidney Dis 1997;30:204-12. Kutner NG, Zhang R, Huang Y, Johansen KL. Depressed mood, usual activity level, and continued employment after starting dialysis. Clin J Am Soc Nephrol 2010;5:2040-5. Knight EL, Ofsthun N, Teng M, Lazarus JM, Curhan GC. The association between mental health, physical function, and hemodialysis mortality. Kidney Int 2003;63:1843-51.